approach to learning a practical discipline. with the sought-after insignia for display on their uniform. The Rainbow Rhino Initiative’s (RRI) objective is to distribute rhino with trained anti-poaching soldiers throughout Southern Africa. The plan is to develop a core breeding population of rhino on Gondwana from which small populations can be distributed on a custodianship basis. 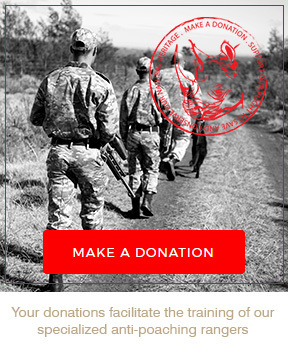 Simultaneously the GCF will be sponsoring the training of field rangers and anti poaching teams to ensure the rhinos’ protection on Gondwana and beyond. The initiative ran its first training course in February 2017 at Camp Charleston, the foundation’s onsite training facility, and intends to run three further training programs during the course of the year. The first course trained eight local general workers in the field of counter insurgency. This course offered skills to individuals on fence maintenance teams to enable them to provide valuable input and assistance to anti poaching units during their day-to-day patrolling of protected areas. This training is a perfect example of empowering people to contribute to the protection of our treasured natural resources. The training was made possible through the kind donation of Sportingbet. A five-week Security Ranger Program starts on the 27th of March 2017 at Camp Charleston where eight candidates working in private and public parks will attend. This training will provide these individuals with the necessary qualifications and skills to be legal and competent security rangers in protected areas and game reserves. A huge thanks to you, Sportingbet, for your sponsorship of a Counter Insurgency Training course held at Camp Charleston, our dedicated Anti-Poaching Training facility on Gondwana Game Reserve. Those participating were exposed to tracking and counter insurgency techniques and spent many hours practicing these skills on the reserve. Formal classroom education covered the theory and concepts of the material but nothing beats the “Boots on the Ground” approach to learning a practical discipline. The students came from across the region and all passed the course and received their certificates. 4 Students in particular excelled and received their level I tracker qualification together with the sought-after insignia for display on their uniform. Sportingbet made this all possible and directly contributed to the Southern Cape being better prepared to combat the constant threat of Rhino Poaching, not to mention the investment in upskilling the guys on the ground. To the South African Wildlife College, Game Ranger’s Association of Africa (GRAA) and everybody at the GCF, congratulations on a successful week’s training. Long may this partnership continue to grow and with the sponsors like this, the sky is the limit! !